Easywalker in South Africa! 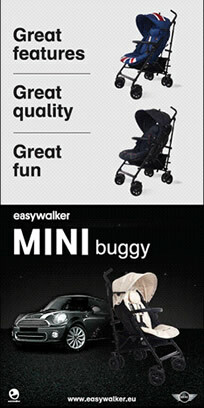 We are excited to bring the innovative Easywalker range of strollers to South Africa. Based in Amsterdam, with a strong European heritage, having introduced the first 3-wheeler stroller to Europe in 1989, Easywalker offers an exciting range of 3 and 4 wheeler strollers. Available in 44 countries around the world, they are known for all-terrain, high quality and intuitive design credentials, as well as being a fun and strong brand. Easywalker likes to keep things simple: focusing on the essence of the stroller, a high quality and safe product that is brilliantly functional. The comfort of the child is their top priority. Whether you walk around the city, into the forest, the snow or the beach, the Easywalker encourages you to get out there and have fun. Another great feature is that the designs continue to be popular with both men and women. This 'no nonsense' approach attracts the typical Easywalker consumer: people with optimism and confidence in life, who enjoy new experiences and like to go out and explore. People who like to combine the city and nature. Above all, the child’s comfort is their top priority.